The Mogao Caves (莫高窟) form a system of 492 temples near Dunhuang, in Gansu province, China. They are also known as the Caves of the Thousand Buddhas, Qianfodong , the Mogao Grottoes or the Caves of Dunhuang. Local legend says that in AD 366 the Buddhist monk Lo-tsun had a vision of a thousand Buddhas and conviced a wealthy Silk Road pilgrim to fund the first of the temples. The temples eventually grew to number more than a thousand. From the 4th until the 14th century, Buddhist monks at Dunhuang collected scriptures from the west, and many pilgrims passed through the area, painting murals inside the caves. The murals cover 450,000 square feet (42,000 m²). The caves were abandoned in the 14th century. The Mogao Caves are the best known of the Chinese Buddhist grottoes, and along with Longmen and Yungang are one of the three famous ancient sculptural sites of China. Buddhist monks valued austerity in life, and they hoped that remote caves would aid their quest for enlightenment. The paintings served as aids to meditation, as visual representations of their quest for enlightenment, and as tools to inform illiterate Chinese about Buddhist beliefs and stories. In the early 20th century, a Chinese Taoist named Wang Yuan-lu appointed himself guardian of some of these temples. Wang discovered an enormous hoard of manuscripts. Rumors of these manuscripts brought European explorers, who trekked across Central Asia to attempt to see and obtain these mauscripts. 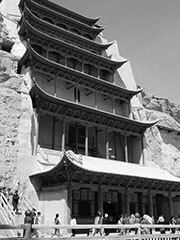 Wang embarked on an ambitious refurbishment of the temples, funded in part by soliciting donations from neighboring towns, and in part by donations from European explorers such as Sir Aurel Stein (who discovered the famous Diamond Sutra in one of the Mogao Caves) and Paul Pelliot who were interested in Wang’s manuscripts. Today, the site is an important tourist attraction and the subject of an ongoing archaeological project. The Mogao Caves became one of the UNESCO World Heritage Sites in 1987.